The Apple Watch can be used to control various MetaRecorder functions. MUSIKMESSE 2015: Apogee has unveiled MetaRecorder, a new 2-channel audio recording app for iOS devices that promises to "revolutionise mobile audio production for video". Offering multi-take recording, tagging and file organisation, this is designed specifically to be used in partnership with various Apogee recording devices, and also the new Sennheiser clip-on iOS mics. It can record at 24-bit/96kHz quality. Interestingly, there's also support for the Apple Watch: you can use the new smart timepiece to start and stop recordings, favourite a take, add markers or set your microphone input level. Find out more in the press release below. The app is free and available now on the App Store, though you'll need a $4.99 in-app purchase to obtain full functionality. That said, owners of certain Apogee and Sennheiser devices can unlock this for free. Find out more on the Apogee website. Apogee Electronics, industry leader in digital audio recording technology since 1985, is pleased to introduce MetaRecorder, a two-channel audio recording App for iPhone, iPad and iPod touch that will revolutionize mobile audio production for video. Apogee's MetaRecorder is the first audio recording app for iPhone to offer intuitive multi-take recording, tagging and file organization for any field recording scenario. The perfect companion to Sennheiser's digital clip-on microphones powered by Apogee, MetaRecorder features 24 bit/96kHz recording quality plus software control of input level and recording presets. 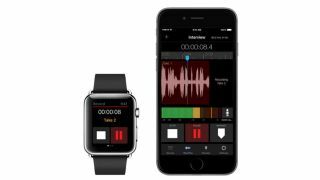 Essential features of MetaRecorder on iPhone can be controlled from Apple Watch - start and stop recording, Favorite a Take, add Markers or set your microphone input level.